A simple lighting stike ignited remote bushland in rugged terrain within the Blue Mountains National Park, over 5km north of the township of Blackheath on 20061113. ..then the wind picked up. It and a second ignition west were allowed to continue burning for days until they eventually coalesced with compounded backburning into a firestorm some ten days later down in the Grose Valley. 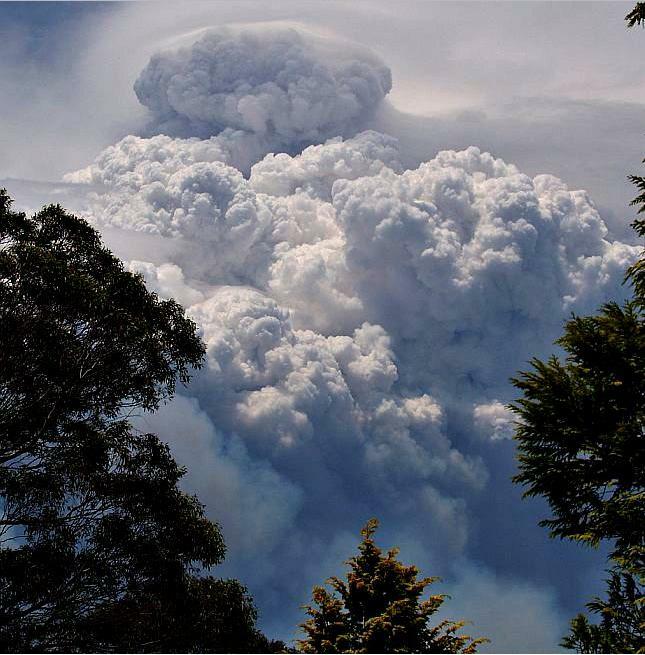 On 20061122, the prized Grose Valley and its iconic and precious Blue Gum Forest were incinerated under a pyrocumulus cloud of towering wood smoke that could be seen from the Sydney coast a hundred kilometres away. Some 14,070 hectares of National Park habitat was burnt. The tragedy did not so much as ‘strike‘ from the lighting itself, but as Blue Mountains residents we saw it ‘unfold‘ over many days and nights under the trusteeship of Bushfire Management. A greenhouse gas estimate was not taken. 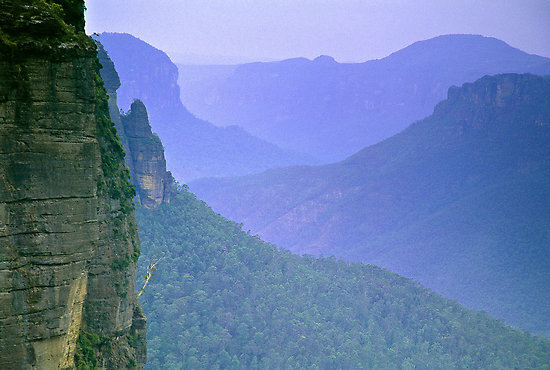 In the days that followed, many Blue Mountains residents and especially the many conservationists familiar with the Grose Valley and Blue Gum Forest over many years became deeply shocked at learning about the loss of this magnificent sacred preserved forest – its tall 300+ year old rare Blue Gums (Eucalytus deanii). Without knowledge of personal accounts, one respects that the dramatic scenes of the smoke and fire inflicted personal trauma with many, given so many people’s long and established personal knowledge, affinity, love, awe and respect for.. 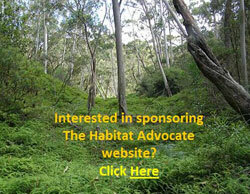 The Habitat Advocate reaches out to these people (doesn’t matter the fact that years have passed) and we choose to express the view of a need to tell truths and to seek some sense of learned maturity from it all. For the Grose Valley contained many tracks, many walks and many special places if one knew where to look. Popes Glen and from Govetts Leap down under Bridal Veil following the popular Rodriguez Pass to Junction Rock then Acacia Flat and the Blue Gum Forest in the heart of the Grose. Many special places includes Beauchamp Falls, Docker Buttress, Pulpit Rock, Lockley Pylon, Anvil Rock lookout, Perrys Lookdown, Hanging Rock, Pierces Pass, Asgard Swamp, and the inaccessible Henson Glen and David Crevasse gorge. To this editor, the return in 2007 to a previously sacred special, but incinerated Neates Glen was emptying in spirit. 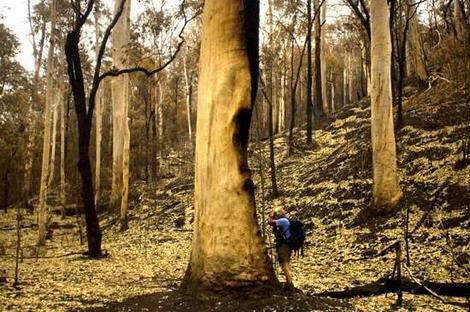 There was heartfelt shock and dismay by many local conservationists familiar with the iconic Blue Gum Forest who became deeply saddened by the tragedy. Phone calls and emails were exchanged with many locals wanting to know the extent of the damage and whether ‘the Blue Gum‘ could recover. The original fire had been fanned westward from Burra Korain Head spotting along the Blackheath Walls escarpment, but then decended and burnt through Perrys Lookdown, Docker Buttress and down and through the Blue Gum. Deliberately lit backburns had descended and burnt out Pierces Pass (Hungerfords Track) through rainforest into the Grose and everyone had seen the pyrocumulus mushroom cloud towering 6000 feet above the Grose on the 22nd. There was an immense sense of loss. 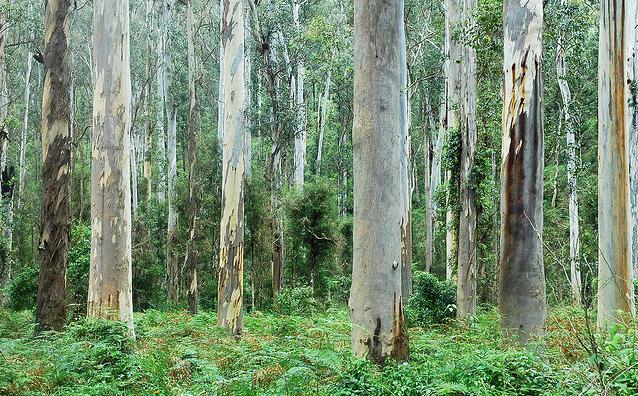 The relatively small Blue Gum Forest, perhaps just several hectares, was unique by its ecological location, by its grand age and by its irreplaceability. The sense of loss was perhaps more pronounced amongst the more mature conservationists, now lesser in number, who knew its original saviours of the 1930s – Alan Rigby, Myles Dunphy and other dedicated bushwalkers who had championed to save it from logging 81 years ago. 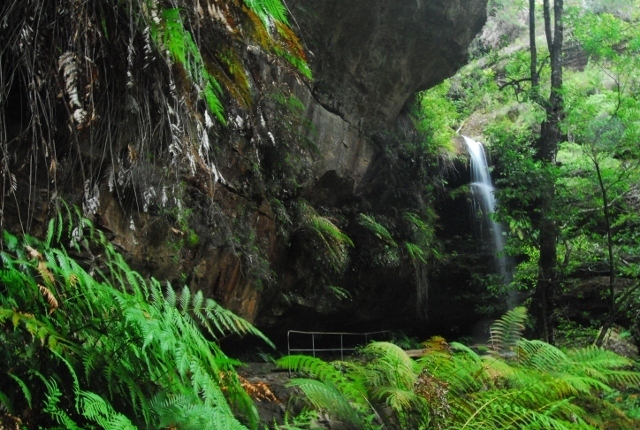 The region is home to threatened or rare species of conservation significance living within the rugged gorges and tablelands, like the spotted-tailed quoll, the koala, the yellow-bellied glider, the long-nosed potoroo, the green and golden bell frog and the Blue Mountains water skink. Many would have perished in the inferno, unable to escape. The Grose is a very quiet and sterile place now, with only birds. But to the firefighters, these were not human lives or property. The day after the firestorm that enveloped the Grose Valley, the wind subsided and from 20061123 through to the final mopping up date of 20061203, the 2006 Grose Bushfire and its many ember spotfires came under bushfire management control and were ultimately extinguished or else considered to be ‘benign‘. It is important to note that during the entire bushfire event from 20061113 through to 20061203, only NSW Rural Fire Service ‘Major Fire Updates’ on its website and headline journalism appeared in the local Blue Mountains Gazette newspaper. Initially, the community, conservationists and ‘firies’ were respectfully passive. In the immediate aftermath of the fire from 20061204 through to the weekly issue of the Blue Mountains Gazette on 20061129, the local community, conservationists and ‘firies’ were letter silent in the paper. It was a combination of shock, preoccupation with the emergency and respectful anticipation of communication from the bushfire authorities. One can assume here that given the scale of the tragedy, many in the Blue Mountains community were respectfully patient in anticipation of an assured announcement from Bushfire Management or some communication process. But none eventuated. The following weekly issue of the Gazette was published on 20061129, but no communication from Bushfire Management. Only dismissive bureaucratic statements came from Parks and Wildlife’s Regional Director Geoff Luscombe with a tone suggesting minimal damage and business-as-usual. Ed: This RFS propaganda photo was included in the media article. ‘Hundreds of fire-fighters are celebrating a return to normality this week after cooler weather and an intense two-week campaign by volunteers and professionals brought a fire in the Grose Valley under control. According to the Rural Fire Service this good weather, combined with a thorough mop-up operation and ongoing infra-red monitoring, means flare-ups are unlikely. However the 15,000 hectare burnt area – including the iconic Blue Gum Forest – is likely to remain closed for the “foreseeable future” due to safety concerns and regeneration. 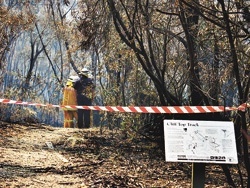 Geoff Luscombe, regional manager of the National Parks and Wildlife Service (NPWS), said the fact that only part of the Grose Valley burnt meant many animals had been able to seek refuge. “Many of the Australian plants and animal species have learnt not only to survive fire but to exploit it,” he said. 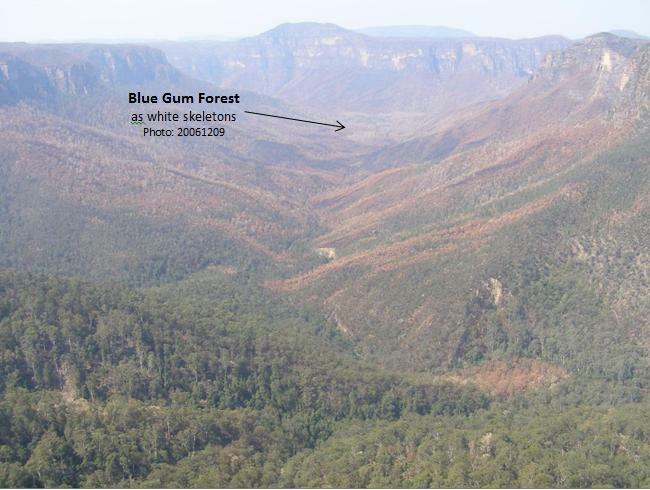 However he confirmed fears that the fire had burnt Blue Gum Forest – a Mecca for bushwalkers and conservationists in the heart of the Grose Valley. A botanist has been sent to inspect the area and there could be ongoing monitoring. Mr Luscombe did not wish to comment on how the fire was handled due to a lengthy absence, but Inspector Jack Tolhurst from the Blue Mountains District Rural Fire Service has warded off any potential criticism. A fire that broke out near Zig-Zag Railway last week has also been contained. [Ed. According to inside reports, Zig Zag Railway Station was accidentally firebombed by an aerial helicopter attempting backburning]. Meanwhile the hard work has only just begun for another group of dedicated volunteers. Blue Mountains WIRES are expecting to rescue a number of fire-affected native animals in coming months as they wander into residential areas for food and water. He said residents who see native wildlife in urban areas should keep pets inside, provide water off the ground in a place safe from predators, and avoid the temptation to feed wildlife. “Things come up for months after fires,” said Mr Keightley. “Do ring us (4754-2946) if you thing something is injured or doing it tough,” he said. So the silence from the firies, from Bushfire Management and from the New South Wales Government ultimately responsible and accountable, was deafening. It was as if the entire Firie fraternity had gone to ground in a code of silence behind closed doors. So naturally the community response was that something smelt fishy. This communication intransigence was a public relations blunder by Bushfire Management, to its detriment. Then filtered out accounts of crazy operational mismanagement during the bushfire and of bush arson by the firies behind the roadblocks beyond the public gaze. Rumours circulated that the initial ignition had been left for burn in the critical first few days of 13th November and 14th November up on Burra Korrain Ridge because it wasn’t right next to a road so that fire trucks could get to it. The fire had even been abandonned. Then the wind picked up and it spread. Airborne firefighting was not called in until a Section 44 incident declaration was effected on 15th November. A second fire nearby to the west near Hartley Vale, purported also lit by dry lightning on 14th Nov, had attracted broadscale backburning from the Hartley Vale Road. But the backburn got out of control, ripped up the valley fanned by winds and crossed over the Darling Causeway on to the Blackheath Escarpment and the Upper Grose to join up with the first blaze. 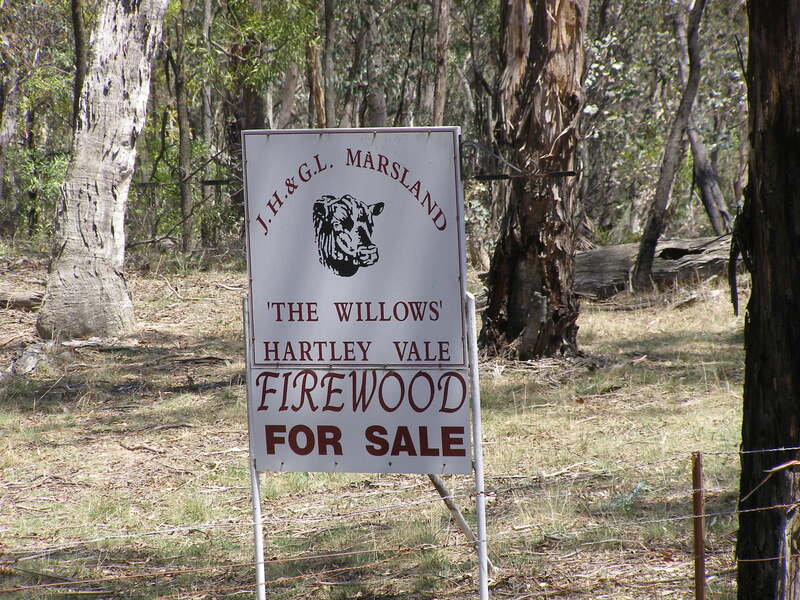 The onground evidence shows that this was a hazard reduction burn starting from alongside the Hartley Vale Road just east of the village of Hartley Vale. Then came the account of Blackheath residents who had their houses subjected to the risk of a deliberately lit backburn during the course of the bushfire. Despite the out of control wildfire being many miles to the north west of Blackheath, a broadscale backburn (some say is was really a ‘defacto hazard reduction‘) was lit along the fire trail below the electricity transmission line near Govetts Leap lookout. But it got out of control briefly and threatened to burn houses in Connaught Road. Indeed the entire Blackheath Escarpment fire from Hat Hill Road south through Govetts Leap Lookout and Ebans Head was started deliberately as a ‘strategic’ backburn. commencing only from the south side Hartley Vale Road, opposite. Eucalypts were burned only at the base, but further up the hill the tree crowns had been burned. The HR had quickly got out of control and then crossed over the Darling Causeway. Once two weeks had passed since the dramatic firestorm and with only silence emanating from Bushfire Management and the NSW Government, local people had had enough and they wanted answers. Some 143 local yet disparate conservationists via ‘jungle drums’ met up, discussed the issue, united informally and agreed to go public. They informally formed the ‘Grose Fire Group‘ and contributed to a fighting fund some $1700 odd and became vocal. Two weeks after the Grose Valley Firestorm the Grose Fire Group managed a full page open letter in the local Blue Mountains Gazette on 20061206 on page 13. 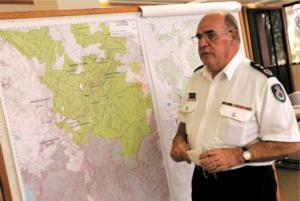 It was directed to the ultimate authority responsible and accountable for the Grose Fire Tragedy, the NSW Government. 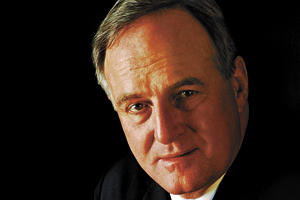 The Premier at the time was Labor’s Morris Iemma MP. The NSW Member for the NSW Seat of Blue Mountains as well as NSW Minister for Environment at the time was Bob Debus MP. Blue Mountains Bushfire Management Committee aligned with Blue Mountains City Council and chaired by Councillor Chris Van Der Kley. “Until today the overall perception from the media was that this fire was a good one. No houses or lives lost”, Mr Muir said. “There where no media updates on the struggle to save Blue Gum. No the reports of success in saving fire sensitive rare plants and rainforests along the escarpment edge. All the media reports spoke of bushland burnt; not on the success of any strategy to minimise the impact on the World Heritage listed national park, while saving lives and property”, he said. 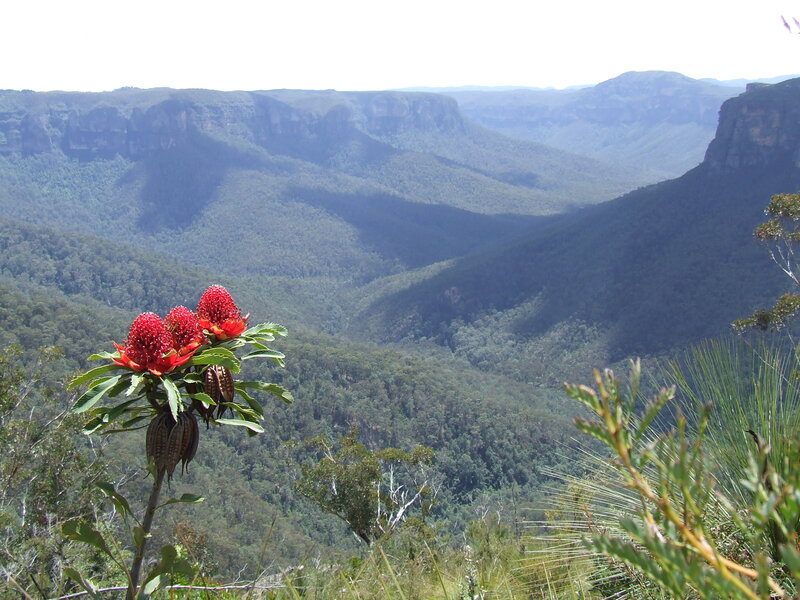 “The Blue Mountains National Park Fire Management Strategy 2004 sets out all the necessary actions to protect the natural environment, as well as life and property. Yet for some reason it appears at this stage that the fire was not fought according to that agreed Strategy, as far as its provisions on natural heritage were concerned”, said Mr Muir. 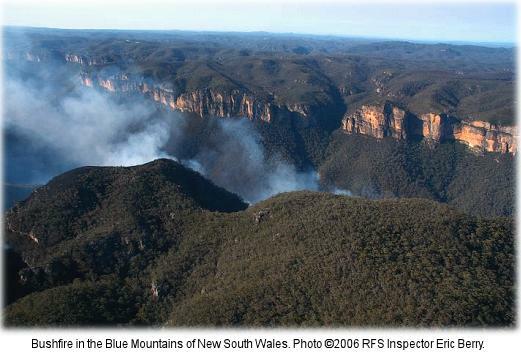 “Increased fire is a major threat to World Heritage values of the Greater Blue Mountains national parks. Unless we develop and implement better strategies to defend the bush, as well as lives and property, then climate change will make this threat much worse,” Mr Muir said. 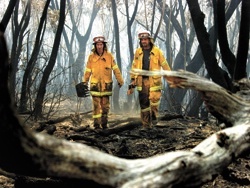 “The fire management strategies and techniques undertaken during the fire need to be re-examined to ensure the diversity of the Blue Mountains forests is protected into the future,” he said. What exacerbated the conflict was not some much that the bushfire had got out of control and had raged through the precious Grose Valley per se, but it was more the defensive, aloof reaction by ‘Firies’ which escalated into a barrage of defensive and vocal acrimony against any form of criticism of the firefighters. In the face of such palatable denial by the Firies,of any accountability the initial shock and sadness within the local community within days quickly manifested into outrage and anger, and even to blame and accusations. Most conservationists however felt a right to question and seek specific answers from Bushfire Management about the Grose Fires, for lessons to be learned, for fundamental changes to be made to bushfire management policy, bushfire fighting resourcing and practices, all simply so that such a tragedy should not be repeated. But the key problem was that the ‘Firies‘ adopted an ‘in denial’ approach to a community suffering loss. 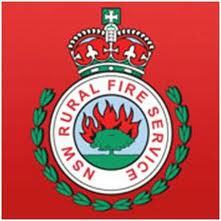 Many Firies denied that they had done anything wrong and rejected any criticism by conservationists. Some Firies vented their anger in the local media attacking anyone who dared criticise. Clearly, Bushfiore Management’s debriefing and review of the bushfire in its immediate aftermath was poorly managed. Underlying the conflict was the Firies urban fire fighting mandate to ‘protect lives and property” – that is human ones, not forests, not wildlife. 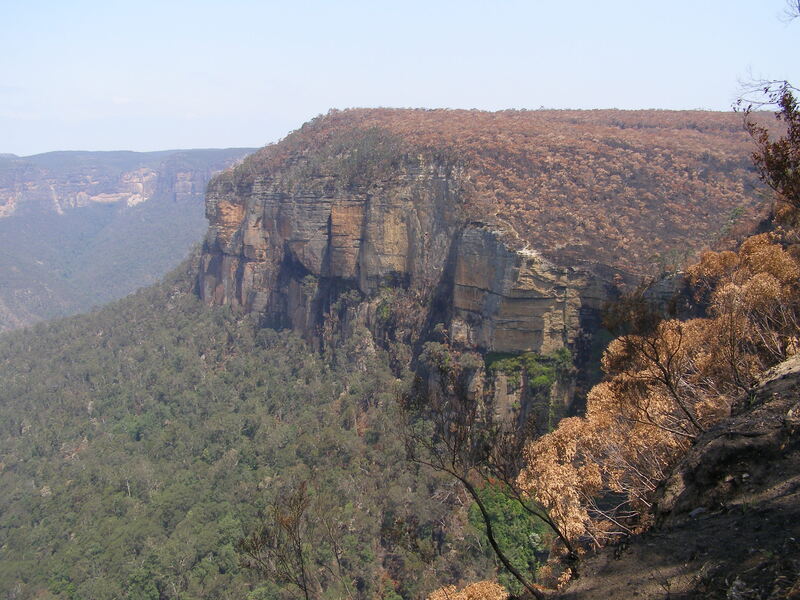 Whereas what emerged with many in the Blue Mountains community was the implicit expectation that the World Heritage Area is an important natural asset to be protected, including from devastating bushfire. Hence, it was a conflict between differing cultural value systems. 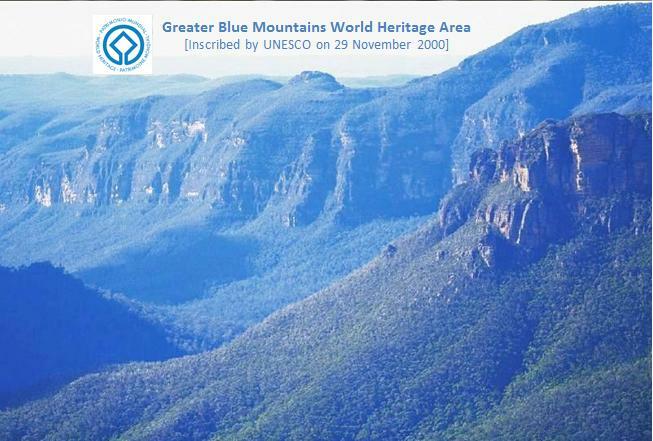 It was about recognition of the value of the natural assets of the Blue Gum Forest and the Grose Valley within the Bue Mountains National Park within the Greater Blue Mountains World Heritage Area. 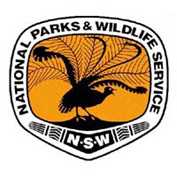 ‘With warmer days just around the corner and continuing dry weather the Blue Mountains Region National Parks and Wildlife Service (NPWS) is again undertaking rigorous preparation for the coming fire season. “Every year around this time the NPWS run a number of fire preparedness days to ensure staff and fire-fighting equipment are fully prepared for the season ahead,” said Minister for Environment Mr Bob Debus. Mr Debus said a number of exercises, including four-wheel drive and tanker driving, first aid scenarios, entrapment and burnovers, were also employed to re-familiarise staff with all aspects of fighting fires. “Burnovers, where fire-fighters are trapped in a vehicle as fire passes over it, is one of the worst case scenarios a fire-fighter can face so pre-season practice is critical to ensure that their response is second nature”, he said. “Local fire-fighters have also undergone stringent fitness assessments to make sure they are prepared for the physical demands of fire-fighting – like being winched from a helicopter into remote areas with heavy equipment, to work long hours under very hot and dry conditions wearing considerable layers of protective clothing”, Mr Debus explained. ‘Residents in the historic Hawkesbury River village of St Albans prepared for the worst as raging bushfires neared. Their predicament came with a fresh fire outbreak in a remote corner of Wollemi National Park, 73 kilometres north of Windsor about 2pm. A Rural Fire Service spokesman said the blaze had destroyed 450 hectares by 3pm. It was being fanned by a string of north-westerly winds and had jumped Putty Road, causing its closure to traffic between Singeleton and Richmond. Winds of up to 80kmh forecast for the early hours of tomorrow are expected to drive the fire towards St Albans. About 45 Rural Fire Service volunteers with 10 tankers have been deployed to protect the small community as residents tried to safeguard their homes from floating embers. At least two helicopters were in the air to assist the operation. ..Other fires continue to burn across the state, with a number of fires across 7000 hectares in the Hunter Valley burning in remote and inaccessible areas. Two other fires, near Forbes and Bathurst respectively, are both contained but the RFS has expressed concerns over the weather and its ability to cause a change in the nature of the the two blazes. 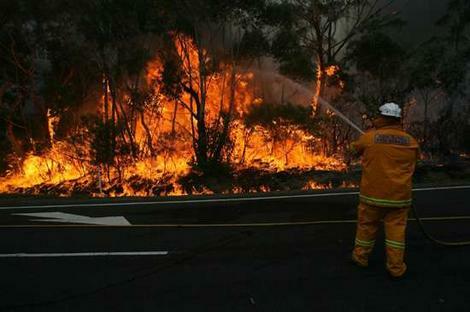 Firefighters set up a containment line to protect the outskirts of Blackheath in the Blue Mountains. Rural Fire Service Commissioner Phil Koperberg said today winds gusting up to 80kmh were predicted for about 3am tomorrow – a time when firefighting planes are unable to fly. At a news conference in Katoomba, Mr Koperberg described the present threat to Blue Mountain towns as “fairly serious … not grave”. However, he urged residents to clean fuel away from their homes as a precaution. This afternoon the most intense efforts were along a containment line at the northern end of Hat Hill Road at Anvil Rock. If that line was breached, the outskirts of Blackheath could be under threat, he said. Firefighters expected wind changes in the area between 4pm and 6pm today. The Bells Line of Road remains closed and the Blue Mountains National Park will remain closed until further notice. ‘Thick smoke continues to drift across the Blue Mountains as the largest firefighting and backburning operation in the region since January 2003 enters its second week. Hundreds of RFS volunteers, NSW Fire Brigades, SES and NPWS personnel, a number of remote firefighting units and 16 waterbombing aircraft are enlisted under a Section 44 declaration with a mission of containing and then attacking bushfires burning in the Grose Valley. The fires are believed to have been ignited by lightning on Monday, November 13 and at the time of going to press had burnt out 3800 hectares of bushland and private parkland in the valley below Blackheath, Mt Victoria, Bell and Mt Tomah. No homes were under threat on Tuesday morning, but the RFS almost doubled its resources in the Blue Mountains on Monday night following unfavourable weather conditions. The NSW FireBrigades also deployed extra fire engines and firefighters ot the Blue Mountains on Tuesday. The large Blue Mountains bushfire broke its containment lines at Anvil Rock about 11 pm on Monday. Earlier, a comprehensive backburning operation involving 300 firefighters commenced on Saturday night between Blackheath and Mt Victoria to protect the townships if conditions worsened. A second phase began along Bells Line of Road between the Darling Causeway and Mt Tomah on Monday morning, continuing to Pierces Pass picnic area to the south. The backburning activities can cause heavy smoke to linger in residential areas and residents are advised to close windows and doors. An emergency operations centre is active in Katoomba under the control of Local Emergency Operating Controller and Blue Mountains Police Local Area Commander Patrick Paroz, with the RFS as the lead combat agency. Blue Mountains RFS community safety officer Eric Berry said remote area firefighting units will continue to attack the fire at the fringe and a fleet of 16 aircraft based in Medlow Bath airfield will operate to contain the fire. The Gazette visited the Medlow Bath Airfield last Friday, which continues to be a hive of activity. Six helicopters, including a giant sky crane chopper, took off and landed several times inside an hour, collecting water loads from nearby dams and dropping them into and ahead of the flames. Kev Adams, an RFS volunteer from Gloucester, described the conditions the pilots had to deal with early last week as wild. ‘Severe weather is expected for the Blue Mountains this afternoon between 2.00pm and 5.00pm. A Total Fire Ban has been declared for a number of areas across the state today, including the Blue Mountains. Temperatures in the Blue Mountains are expected to reach 31 degrees with west-north-west winds gusting up to 45km/h. Fire behaviour yesterday was subdued due to mild conditions and the main front extinguishing in very low fuel levels. Advantage was taken of these conditions to consolidate containment lines. The fire has now been burning for fourteen days and burnt nearly 15,000 hectares. The amount of smoke is likely to increase today. Aircraft and ground crews will be actively patrolling the fire for reactivation of fire edges. Infrared hot spot technology is being used in an attempt to identify stumps and roots that are still smouldering near the edges. Crews can then locate the hotspots and extinguish them. ‘A major bushfire burning out of control in the Blue Mountains again broke containment lines overnight ahead of forecast rugged day for fire fighters. 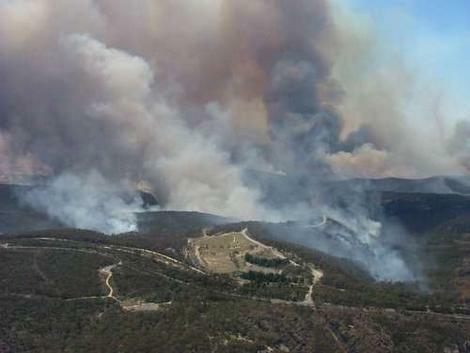 Two separate blazes have blackened more than 8,000 hectares of the Blue Mountains, west of Sydney, with the larger of the two burning on a massive front about four kilometres north of the township of Blackheath. Wind gusts of up to 70kph are forecast to push through that area, around Grose Valley, about 4am (AEDT) today. Blustery conditions expected for most of the day with temperatures in the low 30s (Celsius). Rural Fire Service (RFS) Commissioner Phil Koperberg has said the towns of Mt Tomah and Mt Wilson would be vulnerable to a wind change. An RFS spokesman said crews had been working on a 35km containment line through the night but the bigger fire had now broken its eastern containment lines. He said crews were prepared for the “tricky” conditions expected early today, with wind gusts expected to pick up as the day gets warmer. Waterbombing aircraft cannot take off until first light but no property is currently under direct threat. About 200 Rural Fire Service and NSW Fire Brigade firefighters worked overnight on a back-burn between Blackheath and Wentworth Falls. Firefighters were on standby until temperatures dropped and winds died. They were sent in to light the back-burn as soon as conditions calmed down. Crews spent this morning back burning on the Bells Line of Road and hoping to create containment lines near the village of (Mt) Tomah if winds subside. The RFS said 400 firefighters started work on the blaze this morning. The weather bureau forecast a maximum temperature of 27C, 45kph gusting winds and 17% humidity this afternoon. Two fires, both ignited by lightning 10 days ago, joined up this week and have now destroyed 14,500 ha. An RFS spokeswoman said the fire was burning 2.5 km south of Mt Tomah and 7km north of Wentworth Falls…Crews and 15 aircraft will remain on standby to extinguish any spot fires that pass over teh containment line. Fire-bombing helicopters Elvis and Shania were likely to be sent to other fires burning across NSW. This same photo was re-used by the Blue Mountains Gazette a year later on 20071024 (page 7) to support an article by the Rural Fire Service incident controller in charge of co-ordinating the fire-fighting of the 2006 Grose Fire, Mal Cronstedt, who responded to an article in the paper on this subject by The Habitat Advocate dated 20071010. ‘Hundreds of weary but determined firefighters are steadily gaining the upper hand over a Grose Valley bushfire that has burned about 15,000 hectares since November 13. Daylight waterbombing by a fleet of choppers based at Medlow Bath airfield, increasing access by remote area firefighting units, successful backburns along the northern and southern escarpments and milder than predicted weather conditions since Saturday have limited the spread of the fire. At the time of going to press, 130 RFS, NSW Fire Brigades and NPWS firefighters and nine helicopters were conducting backburns, mopping up buffer zones and cutting in access trails to the fire’s fringes. The active front of the fire was within containment lines yesterday morning, allowing the Bells Line of Road and Mt Tomah Botanical Gardens to re-open. A small fire that started at Mitchells Lookout in Mt Victoria on November 23 is extinguished and investigations are continuing into its cause. Blue Mountains RFS is warning residents to remain vigilant by continuing to prepare their homes for fire if conditions worsen and to immediately report any suspicious activity to CrimeStoppers by calling 1800-333-000. The milder conditions are a welcome relief from the heat and 100 km/h wind gusts that put residents of Hazelbrook, Linden, Faulconbridge and Winmalee on high alert last Wednesday afternoon. An explosion within the fire, which witnesses described as causing a mushroom-like cloud to develop, ignited spotfires four kilometres north of Lake Woodford and five kilometres north of Hazelbrook. Many residents headed home early from work to clear gutters and roofs and two Winmalee schools opted to close for 24 hours as a precaution. Eighteen water-bombing aircraft attacked the spotfires, extinguishing one within hours and the second by Thursday evening. For daily fire updates and advice, go to www.bluemountains.rfs.nsw.gov.au, phone a dedicated 24-hour hotline manned by local volunteers on 1800-264-525 or visit your local RFS station, staffed by volunteer station officers. “These people are the unsung heroes of the RFS,” Blue Mountains RFS public liaison and education officer Paul McGrath said. It was addressed not to the ‘firies’, but to the NSW Government. It is easy to see why the Blue Mountains, with their Eucalytus tree oil suspended in the atmosphere, get their famous name. This entry was posted on Saturday, July 7th, 2012	and is filed under Blue Mountains (AU), Threats from Bushfire.